If you are looking for a guide to the “who’s who” of Enterprise Content Management, the Gartner Magic Quadrant is it. The vendors are measured on Completeness of Vision and Ability to Execute. Each vendor is plotted within a quadrant and categorized as either a; Niche Players, Visionaries, Challenger, or the coveted Leaders position. Recently I wanted to look at something a little different, the trend over years. What I found “may” be interesting. First, let’s look at the Magic Quadrant. Gartner performs analysis of vendors in a given space though both presentations and demonstrations. Their requirements are based on information Gartner hears from the customers. How each vendor meets those needs is then calculated to plot where each vendor lands based on Completeness of Vision and Ability to Execute. While Gartner doesn’t share the individual rankings in their report, one can assume that vendor’s position within the quadrant is relative and validly represents their score. In this case, that one who assumed was me. During the report period, nine vendors held positions in the Leader Quadrant. In 2005, there were six leaders. Three of those were acquired; Hummingbird by OpenText, Stellent by Oracle, and FileNet by IBM. The other tree leaders, EMC, IBM, and OpenText, would remain in the Leader Quadrant though the reporting period. They were joined in the Leader Quadrant by Oracle in 2007, Microsoft in 2009, and Hyland in 2011. But I wanted to see a little more detail. I wanted to see trends. To get a view of the trend, I decided to copy and match the scale of Magic Quadrants from 2005, 2007, 2009, 2011, and 2012 in a graphics program. I pasted each chart overlaying them with each other. I also set the chart background to the transparency color. This allowed each point to pass visibly through to the next chart giving a visual representation of all the points for the five years in the vendor landscape. This effort showed me three distinct visual trends for the six vendors currently in the Leader Quadrant. 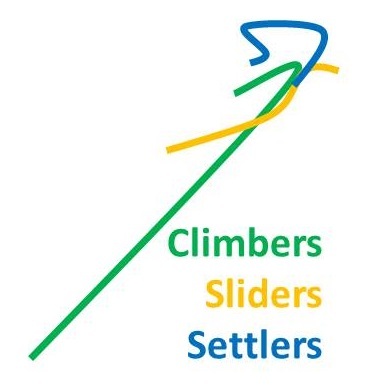 I called the representations that appeared; Climbers, Sliders, and Settlers. And oddly there were two vendors in each category. Two vendors went from Visionaries in 2005 to Leaders in two and four years, respectively. Oracle and Microsoft visual representation were that of climbers. Looking at their history, this tracks with both Oracles acquisition of Stellent and the growth in Microsoft SharePoint. Interestingly both had a slight fishhook slide towards the left from 2011 to 2012. Also looking at the overlays, Microsoft had the furthest point along the Ability to Execute axis. Two vendors went had slight slips along the Ability to Execute with a stronger slip along Completeness of Vision. Still both maintained relative position with the other leaders. EMC and OpenText visual representation was that of sliders. Also looking at the overlays, EMC had the furthest point along the Completeness of Vision axis. The real interesting visual representation was the last two vendors in the leader quadrant. They seemed to circle around a specific center-point along the two axes. IBM and Hyland had the visual representation of settlers. Again an odd revelation, IBM had the furthest combined point along both axes. Was there a value in this exercise? I’d like to think so. I believe that there is significance in the relative position of the vendors in the quadrant. That being the case, the movement report-to-report would indicate a trend over the period. What’s interesting the six vendors paired up into three general trends. I believe is representative of the stabilization of the ECM space over the last seven years. Very interesting observations Marko. But comparing MQ movement year-on-year, would only make sense if the assessment criteria remained the same every year. ECM as a subject and as a market has changed dramatically since 2005, with ECM vendors embracing BPM and Case Management, the growth in synergies with Collaboration, the explosion of the eDiscovery market space, the evolution of Search to Content analytics and, last but not least, the resurgent focus on management of volume growth. So, the shift in position of vendors on the quadrant, is as much a factor on how vendor dynamics and marketing are shifting Gartner’s focus, as it is related to the change in vendor’s abilities and strengths. I would be reluctant to talk about “stabilization” in a market like ECM, which is changing its stripes continuously. In the context of this, it would be interesting to plot how Gartner’s definition of ECM and criteria inclusion (or not!) has changed over the same period. You’re right; it would be interesting to see how Gartner’s ratings have changed over the years. Maybe Gartner will cover that someday. But I disagree that comparing trends only make sense if the criteria stayed the same. If that were the case, then every product marketing gem would complete their products in such a way that everyone would eventually be in the top-right-most position. And that report would have no value. I like that Gartner’s evaluation changes with market trends in the user community. I think it is what makes it so valuable. The evaluation is not one where we look to see which vendors have passed which checkpoint but which vendors keep up with the changing game. If you don’t keep up with the changes in the market then you don’t stay in position. For product managers, it’s easy to know what you’re missing but not so easy to know what new trends may be emerging. Taking your points, an ECM vendor that did not embrace BPM, Case management, or eDiscovery did not stay in position. It really shows that the vendors in the quadrant have stayed current. The Magic Quadrant isn’t just a process done in a silo. It includes briefing with the vendors so new trends, requirements, and evaluation criteria is discussed. Simply look at the start of the Magic Quadrant. When it was first published it was Magic Quadrant for Document Management. That report was last published in 2003. In 2004, the report became the Magic Quadrant for ECM. This showed that there was a major change in what was expected of the industry and vendors needed to change. As to stabilization, for now I choose not say much. But I will say that this will be addressed in a (not to distant) future article. good observations and I agree. the definition is not static. Each vendor’s movement is also impacted by changing strategic emphasis and acquisitions. Inordinate advances from an acquisition appear to drive the “fishhook” but vaulting into the leader quadrant doesn’t guarantee you will stay there without thoughtful execution.